Vintage One: 20 years of Mtn Bike passion and counting. : Me and Rebecca. Yeah, I know it should be Rebecca and I, but I like the sound of it the other way better. So, here I am at the MTB Demo tent, talking to Nic Sims of Specialized about the possibility of getting a ride on a 29er Camber, and a young woman walks up to Nic and asks him a question. I have no idea who she is, but she looks very pro in her full on Specialized team kit. Nic says to me, "Mike, I want you to meet Rebecca". At that moment, I glance at her jersey and see '24 Hour World Champion' screened onto it. Oh. THAT Rebecca...as in Rebecca Rusch. I actually say to her, in a disarmingly witty and suave moment, "That Rebecca?". "Yes", she says. That one. Cool! So, it turns out that a film guy is here to shoot some footage for the next movie covering the Leadville 100 (remember last year's Race Across the Sky?) and this day will cover some time for Rebecca leading up to her race. She was asking Nic if he had anyone that would not mind being on camera in a trip up the ski lift with her and the camera guy. I guess they just needed an extra so it was not her all by herself. I was headed up anyway with the Stumpy FSR 29er, so up we went, chatting and such. 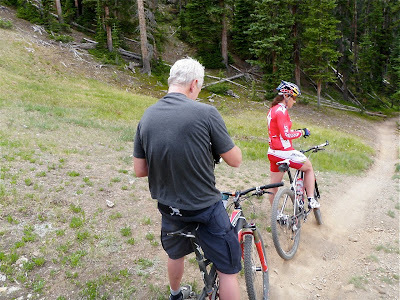 Then, she asked if I wanted to be in the singletrack footage in front of a guy filming us with a helmet cam. Sure, I can do that. Then, I actually wore the camera on my head to get some faster sections of trail filmed that was a bit beyond the limits of the camera man. Cool. I will tell ya, Rebecca can ride a bike. Not doubt about it. Video guy... Frank, IIRC, fiddles with camera mid-mtn. She can ride that 29er hardtail pretty fast downhill. After that, we had lunch with her and some other media folks. She is a very cool lady to hang with, is quite the rider, and I wish her the best of luck. I may end up either in front of the camera or behind it if any of the footage gets used in the next movie. Or, my moments of fame may end up on the 'cutting room floor'. Either way, it was a lot of fun. Sometimes you are just standing in the right place at the right time. To put your mind at ease, "Me and Rebecca" is well and good for the title of a blog post. "Rebecca and I" would be appropriate as well. Trust your writer's ear. Its use in a sentence is where it matters. It is proper to use "me and Rebecca" as the object in a sentence. For instance, "The camera man filmed me and Rebecca." When used as the subject things change. "Rebecca and I rode the single track." A simple key is to break your phrase down to its individual parts, "Rebecca" and "Me", and make sure each agrees with the verb individually. So in my first sentence "filmed me" and "filmed Rebecca" sound reasonable and agree with the verb. "Filmed I" just wouldn't be right. In the second sentence you have "Rebecca rode" and "I rode". Sounds right. You wouldn't want to say "me rode", unless you were Tarzan or the Cookie Monster. Hey! Thanks David! Excellent comment. I actually like the Cookie Monster approach and I am especially fond of Yoda speak. Happiness is a full bladder. A new pony in the barn. The 12 hours of Denver. S24O with JeffJ and Ted.